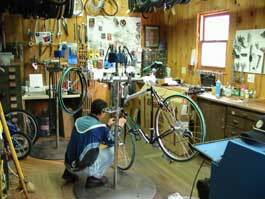 We Have Been Providing Top Quality Bicycles and Accessories Professionally Installed and Assembled for Over 30 Years. We Are Your Service Department! Our Many Years of Experience and Dedication to Excellence Will Bring Your Bike and Skis to their Maximum Potential. May it be a Dirt Poundin' Trail Machine, Street Smokin' Road Bike, or anything in between - We Offer You the Best Bikes and Service at the Right Price! During the Winter Months, We Continue to Service our Customers with Our State of the Art Ski Sharpening Machine. We Offer Edging, Wet Belt, Precision Stone Grinding and Base Repair to keep you Happy on the Slopes. Stop in and Experience our Genuine Attention to Your Complete and Ultimate Satisfaction! Come Visit Chris and Ray Jr. for all your Cycling Needs! Experience the full line of quality bicycles from SPECIALIZED!